After players join a Guild, they can challenge Guild Dungeon with fellow memebers, upgrade Guild Tech and permanently increase character stats. ·Guild Function unlocks at level 20, click Guild Icon to join or create a Guild. ·If you choose to join a Guild you can view all Guilds on your server. Choose a Guild that is not full, you can enter Guild if leader approves your application. ·You need to be VIP1 or above to create a Guild. Pay 200 Diamonds and enter Guild name to create. 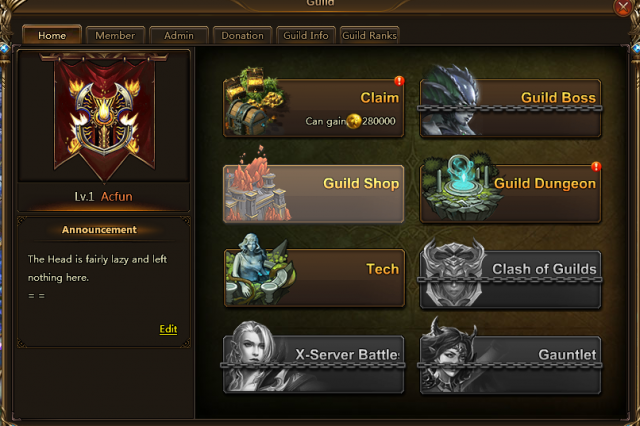 ·You can access Guild Dungeon, Guild Boss and other events through Guild Panel. ·5 challenge attempts daily, spend Diamonds to purchase more attempts. ·Challenge to gain large amounts of Guild Contribution, harder the selected difficulty and damage dealt, greater the Contribution. ·Clear Stage to gain EXP for Guild, players who clear stage also gains additional Diamonds. ·Whenever a stage is cleared, the next one is unlocked. Guild Leader can choose which stage to challenge for the next day. ·Whenever a stage is cleared, a Stage Chest can be opened by players, granting various random rewards. ·Guild Dungeon is reset daily at 5 AM, default is last cleared stage. ·Guild Contribution can be used to exchange items in shop. ·Guild Leader/Guild Deputy can spend Guild Fund to research Guild Tech, Tech level is determined by Guild level. ·Guild Members can spend Adventurer's Seal to learn Tech to permanently increase stats. ·Each Guild can have its own Tech focus.